D.C. United and United Wellness & Sports Rehab GET TO KNOW YOUR TEAM! 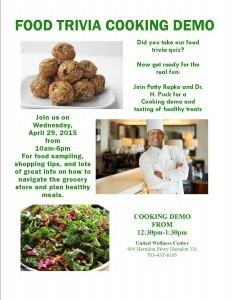 Stay on top of all the latest News, Events & Information from United Wellness. Be sure to join us on April 29, 2015 for our “food day.” We will be featuring food demos, tastings, recipes, and healthy eating and shopping tips. As a special surprise, Dr H. will be joining Health Coach and chef Patty Repko for a cooking demo at 12:30pm. Everyone that attends the cooking demo will be entered into a drawing for a free grocery store tour for two with Patty Repko, CHHC, AADP. Are You Ready to Test Your Food Knowledge? ARE YOU READY FOR SUMMER?